A new, extensive patent application details how a new iPhone model with a near-field communications chip could serve as the connected centerpiece of an automated digitally connected home. Apple's interest in NFC chips doesn't end with the iPhone in a new patent application discovered by AppleInsider this week. The filing, entitled "System and Method for Simplified Control of Electronic Devices," also shows an Apple TV, iMac, various iPods, and even third-party devices like a cable box, PlayStation controller, or even a home sprinkler system equipped with NFC. Illustrations accompanying the filing show a new radio frequency identification, or RFID, application available on the iPhone. Selecting that application allows the device to begin searching for nearby RFID-enabled devices. Electronics can also be paired by using a scanning a barcode using the camera on the iPhone. In this way a user could securely take control of their own devices easily and quickly. 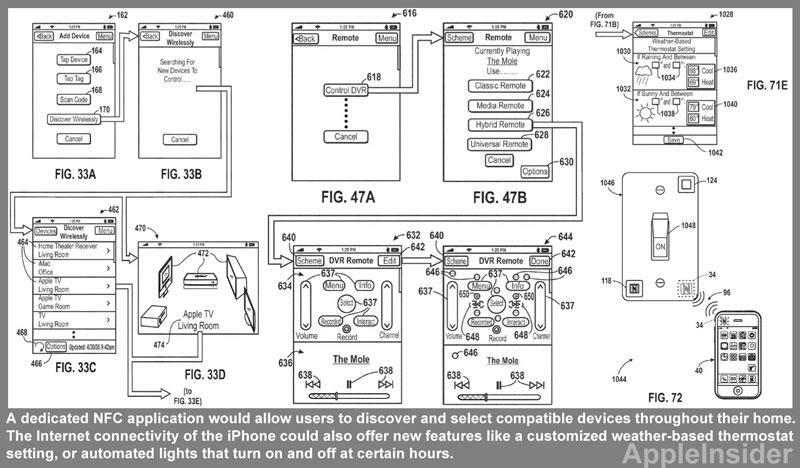 When a device is discovered, the iPhone could automatically install the appropriate plug-in to act as a controller. This method would allow the iPhone to gain compatibility with third-party devices that may have complex or unique control schemes. The system is shown giving users the ability to select and control a number of devices, including multiple Apple TVs in the same house, an iMac, a home theater receiver, or a television set. To assist in the control of a plethora of devices, Apple's NFC application would allow users to sort their list of devices by categories, such as "Entertainment," "Home," and "Office." Compatible devices could also be listed by proximity to the iPhone. When connected to a cable box and acting as a universal remote, the iPhone would offer typical control options like changing the channel and adjusting the volume, but it is also shown with programming information such as displaying the current channel number, what show is on the air, and a description of the program. 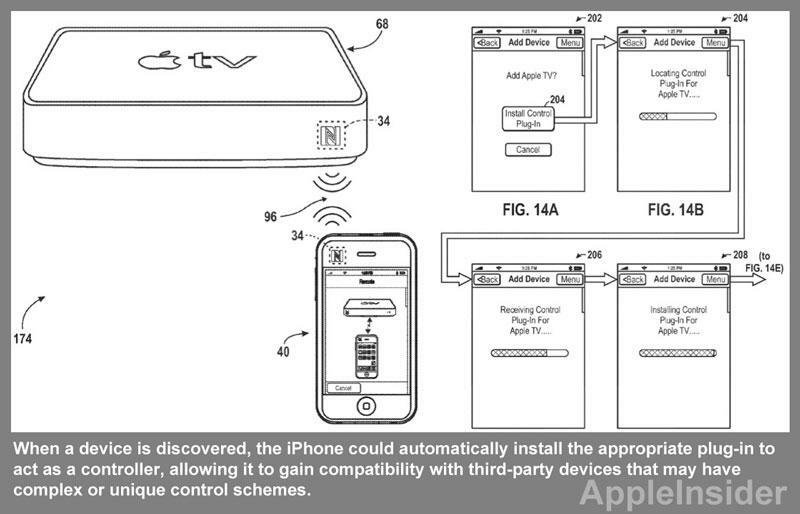 In yet another example included in the filing, the iPhone uses an RFID chip to wirelessly control a home thermostat. The proposed system would allow users to adjust the temperature in their home based on data obtained by the iPhone. For example, a weather-based thermostat setting could allow users to adjust the temperature based on whether it is raining or sunny outside. The system is also shown controlling the lights in a person's home, a security system, the garage door opener, and a sprinkler system for a truly connected home. 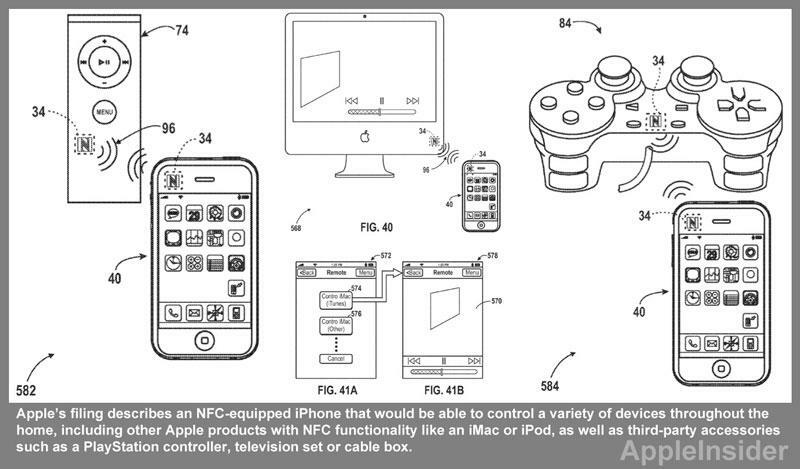 With an NFC chip, the iPhone could even act as a remote control to a camera. A compatible digital camera could wirelessly transmit its current picture, and the iPhone could be used to zoom in, zoom out, enable or disable the flash, and take a picture. The details come from a massive 114-page filing first submitted to the U.S. Patent and Trademark Office in March of this year and made public this week. The proposed invention is credited to Michael Rosenblatt, Gloria Linn, Sean Mayo, and Taido Lantz Nakajima. There have been rumors for years that Apple plans to include an NFC chip in an upcoming version of the iPhone. Expectations for RFID capabilities in the 2012 iPhone picked up steam after Apple announced Passbook for iOS 6, a new application that will organize tickets, store membership cards and airplane boarding passes. Industry watchers have speculated that Passbook could become even more full-featured with a new NFC-equipped iPhone that could act as a digital e-wallet, allowing wireless authorization of transactions as well as secure e-ticketing. Apple Chief Executive Tim Cook was asked about the future of Passbook this week, but only went as far as to say that the new iOS 6 application will be a "key" feature of Apple's next-generation mobile operating system.